Guys, I've got two major things to tell you about today: High intensity interval training and PlantFusion protein powder. Let's start with high intensity interval training because that's how I started my day. 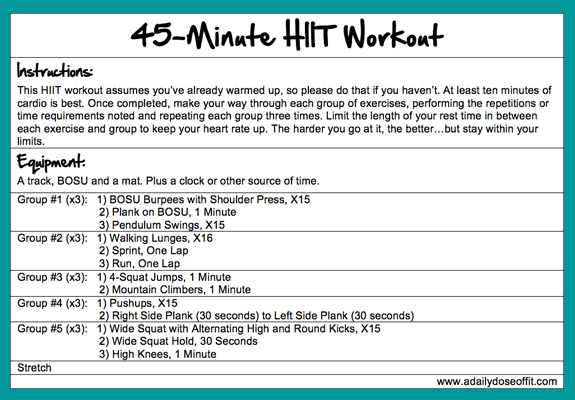 Are you familiar with it, otherwise known as HIIT? You can visit the FitFluential blog for a detailed description of this type of workout, but it basically involves a series of exercises that are both timed and repeated with little rest in between. All in an effort to get the heart rate up. I obviously zeroed in on the Chocolate Raspberry because this combination so very rarely is a bad thing. Once shaken with a glass of water, it turned into a frothy beverage akin to a glass of chocolate milk. With a hint of raspberry, of course. Now, I don't use protein powders on a regular basis—only when I'm in a pinch for time—but this bad boy had me wanting more. What I liked about it, aside from the flavor, was the fact that PlantFusion powders don't contain anything more than plant proteins (and obviously some natural chocolate and raspberry flavors). And yet, you get about 21 grams of protein per serving which is about half of the required amount (according to a 2,000 calorie diet). And all you have to do is combine it with water and shake-shake-shake. It's not like chicken, which has to be made and it's certainly not like conventional whey proteins that may (or may not) contain unnecessary additives (translation: chemicals). Again, I'm not the biggest advocate of protein powders, but I like to have some on-hand. I can't get this stuff by me, but you can rest assured I'll pick up a packet or two every time I hit the natural foods store in South Bend. I know they carry it. And if they carry it by you, you might as well try some if you're into protein powders. I think tomorrow I'll add some avocado. Mmm, you bet I will! Question: What did you have for lunch today? You couldnt be more right about HIIT. I love all forms of it be it TABATA, BURST or Surge training. I shuffle my workouts among these three, they work wonders for me. HIIT is indeed the best way to reduce body fat and tone up simultaneously in a short period of time.